Mr. Robot, The People v. O.J. 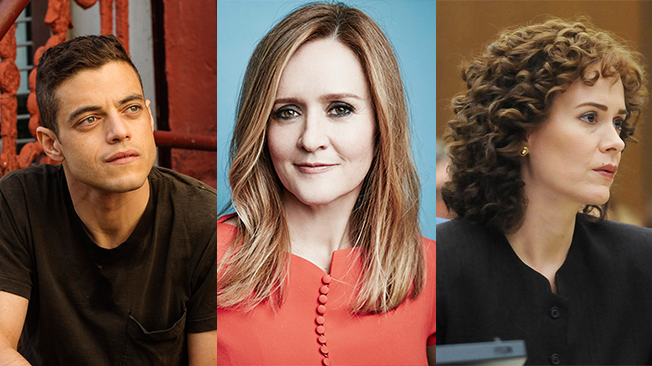 Simpson, Making a Murderer, Full Frontal with Samantha Bee and UnReal were among the shows that racked up multiple nominations today as the Television Critics Association announced its 2016 TCA Awards nominees. The TCA, which is comprised of more than 200 North American TV critics and journalists (including myself), honors outstanding television programming. The organization often recognized acclaimed shows that Emmy voters overlook—like The Americans, which today nabbed three nominations—and can give a boost to freshman series hoping to break into the Emmy field when those nominations are announced on July 14. This year's nominees include a number of freshman series, all of whom are also hoping to make a dent in Emmy nominations next month: Mr. Robot (four nominations overall), Crazy Ex-Girlfriend (three nominations), Master of None (three nominations), UnReal (three nominations), Full Frontal with Samantha Bee (two nominations), Marvel's Jessica Jones (one nomination), Underground (one nomination) and I Am Cait (one nomination). Among the other notable TCA Awards nominees were Netflix's Making a Murderer (Outstanding Achievement in Reality Programming and Program of the Year), Julia Louis-Dreyfus (Individual Achievement in Comedy, which she won last year), Last Week Tonight with John Oliver (Outstanding Achievement in News and Information, which it won last year) and You're the Worst (which was overlooked its freshman year, but landed two nominations for Season 2: Outstanding Achievement in Comedy and Individual Achievement in Comedy for Aya Cash). The Americans, Fargo, Game of Thrones, Making a Murderer, Mr. Robot, The People v. O.J. Simpson and UnReal will compete for the most coveted award, Program of the Year. The TCA Awards also hands out a Heritage Award each year honoring a long-standing program with a major cultural or social impact. This year's nominees include The Larry Sanders Show (whose creator and star, Garry Shandling, died unexpectedly in March), The Mary Tyler Moore Show, Seinfeld, Star Trek and Twin Peaks. Mr. Robot and The People v. O.J. Simpson led the pack with four TCA Awards nominations each, while HBO had the most nominations of any network with 12, just edging out FX/FXX, which had 11. Winners will be announced Aug. 6 at the Beverly Hilton Hotel. Jaime Camil, who plays Rogelio on The CW's Jane the Virgin, will host the ceremony.